The jogging stroller can be an active family's ticket to maintaining a healthy lifestyle and getting (sometimes much-needed) exercise. But what do you do when you want to get in a workout beyond just walking or running? 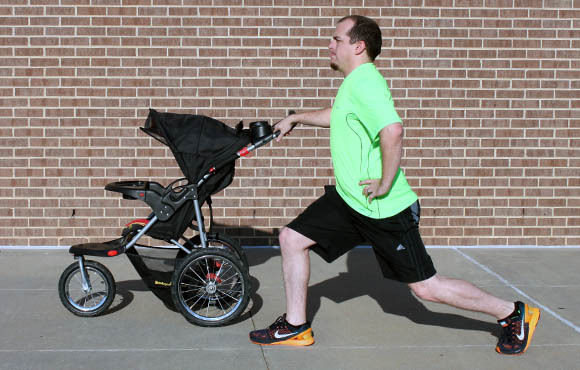 You grab the kiddo, put him or her in the jogger and head out—just as you would if you wanted to log some miles. The stroller offers plenty of opportunities to add resistance exercises to your regimen and get in a heart pounding, total-body circuit workout. 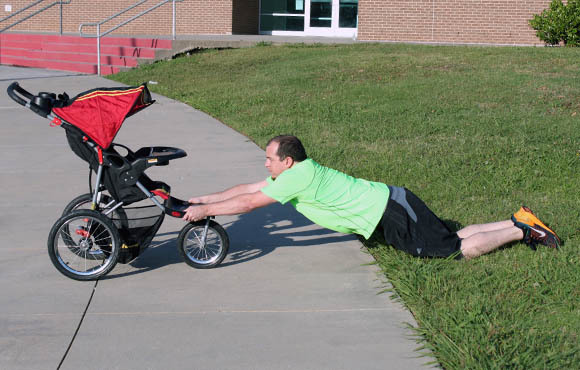 Babies will be happy to stay in the stroller as you perform this workout, and as your child gets older, stopping to do each exercise will become a great chance for them to get out of the stroller and stretch their legs. Or they can try to do the exercises, too, to give you a little competition. To start, walk or run for 10 minutes. When you stop (don't forget to put on the brake), perform 12 to 15 reps of the following exercises. After completing the circuit, return to a walk or run for five minutes. Make a total of 3 to 5 stops before cooling down and heading home. Holding onto the handle of the stroller, take a wide stance with your knees and toes pointing slightly outward. Sit your bottom back and down, coming into a pile squat. Pause for a second at the bottom of the move before driving through your heels to come to standing. As you rise, lift one leg to the side. Alternate lifting each leg as you rise from the squat. Step to the right side of the stroller and hold the handlebar with your left hand. Step your right foot back and drive your right knee toward the ground, being sure to keep your hips square and your shoulders over your hips. Pause at the bottom and rise up as if you're being pulled up. As you come to standing, brace through your core and lift your right knee up. 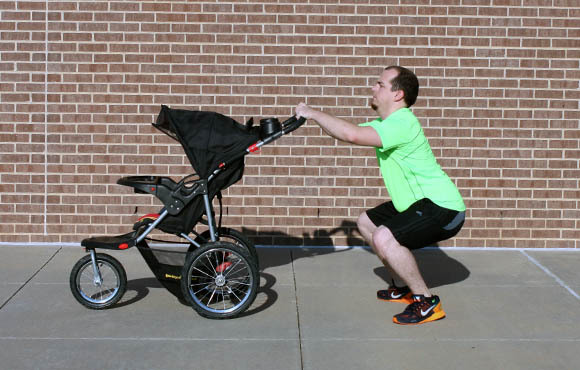 Switch sides after 12 to 15 reps.
Face the front of the stroller. Bring your hands to the ground and jump your feet back, lowering your chest to the ground. At the bottom of the movement, lift your hands off the ground for a moment. Place your hands back underneath your shoulders and jump your feet inward. Rather than jumping straight up like a traditional burpee, do a lateral jump (hop to the side). Perform another burpee and then hop back to center. The farther you can hop side-to-side, the more entertaining it will be for your audience. 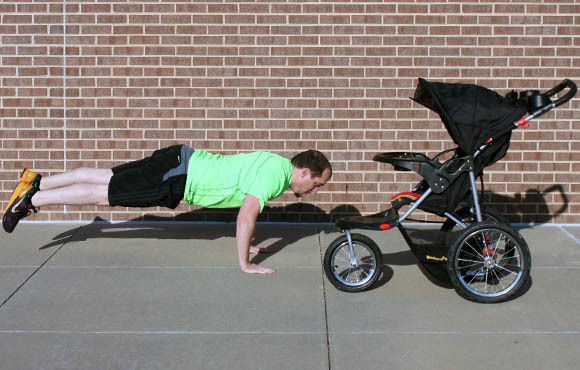 Face the front of the stroller and get into a push-up position, whether on your knees or on your toes. Lower your chest to the ground, pause and then drive through your palms to come to a plank position. 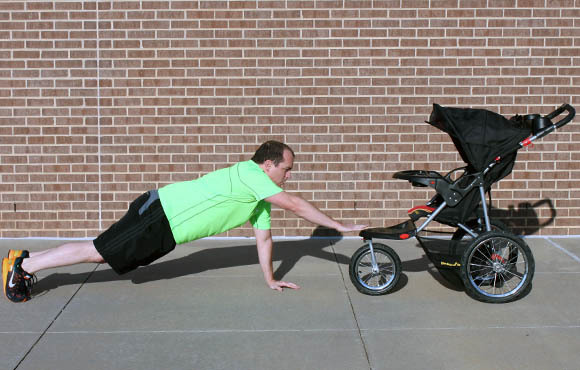 At the top of the push-up, lift one arm and touch the stroller. If you're little one needs a good laugh, tickle his or her feet. Put your hand back into position and lower down, making sure to stay strong through the core. Pause and come to the top, lifting your opposite hand toward the stroller. 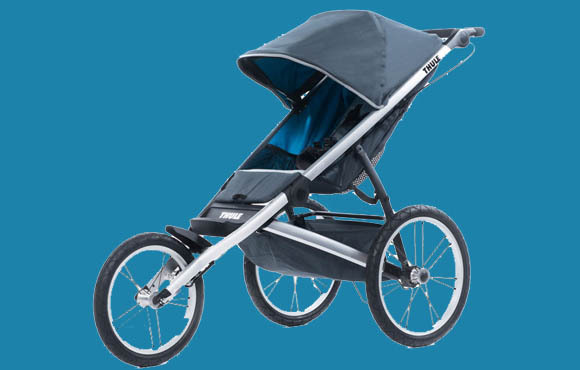 Release the brake on the stroller and find a nice spot of pavement near the grass. Face the stroller as you kneel down in the grass. Hold onto the footrest of the stroller as you push it away from you. Pause, pulling your belly button into your spine. Pull the stroller back as you return to a kneeling position.